Innovative Auctions, Inc. » Online Only Auction Of Antiques, Steins, and More! Online Only Auction Of Antiques, Steins, and More! Checkout Date & Times: Items not picked up or that shipping has not been arranged by pickup day will be forfeited. Pickup on April 19th at our 822 Distribution Drive Warehouse from 10-2PM. Pitcher measures 8" tall. Marked "Clay City Pottery" on the bottom. 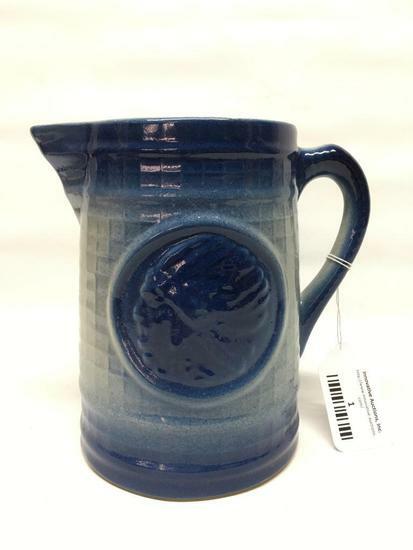 Clay City Pottery is made in Indiana. Pitcher measures 5.25" tall. It is likely this was made around 1932, the anniversary of George Washington's birth. Tray measures 4.25" x 6.5" x 2.5" tall. They really don't get any cuter than this! Can measures 12" tall. Excellent condition. Ship measures 12.25" tall. Usually these are found with the flags broken off. The flag's on this doorstop are undamaged. Bucket measures 10.75" tall, not including handle. Partial label. Pitcher measures 7" tall and is dated 1991. Framed size is 13.5" wide x 19.5" tall. Nice old antique frame but cannot verify age of print. Box measures 18.5" x 9.5" x 5" tall. Civil War era box. Pail measures 7.5" tall x 7.5" in diameter. Really excellent condition. Lantern measures 7" tall. Holds a single candle. Funnel measures 4.5" in diameter x 4.5" tall. Framed size is 9.5" x 11.5". Nice antique frame, but cannot verify age of print. Stein measures 10" tall. Marked "Made In Germany" on bottom. Stein measures 9.5" tall. Marked "Made In Germany" on bottom. Crate measures 12" x 18.5" x 4.5" tall. Dutch oven measures 6" tall. Unmarked as to maker. Might need to be cleaned up a little. 4 mallets, 4 balls, 1 stake, & 7 wires. The shapes are a fish, rabbit, (2) different chicks, a round, & an advertising"Malleable Range"
Knife measures 14.5" open & 8.25" closed. 3 blade stockman style. Mint condition. Knife measures 15" open & 8.25" closed. 2 blade trapper style. Mint condition. Bowl measures 5" in diameter x 2.75" tall. A little more contemporary, but good quality.